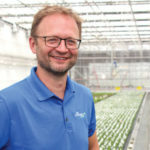 Aron Hoff ([email protected]) is Head Grower at Meyers Fruit Farms and Greenhouses in Niagara-on-the-Lake, Ontario, Canada. He is also Greenhouse Grower’s 2017 Head Grower of the Year. Head Grower Aron Hoff was looking for a way to customize soil mixes on multiple planting lines in real time. The system he’s now using makes the process much simpler.